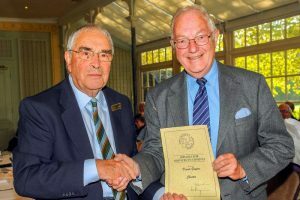 Contributions by two Chester Croquet Club members were recognised at the recent Croquet Association AGM and Council meetings on Saturday, 20 October. Club secretary John Dawson, who is the NW Federation’s representative on the CA Council, was elected as Vice-Chairman of the CA Council and Chairman of the CA Mangement Committee. Bringing a comprehensive management system to the club during a period of major expansion. Not only were roles managed to meet the needs of the club but he established a culture of willingness amongst members to do “their bit for the club”. As well as chairing the Committee for 11 years with all the normal duties that requires he initiated an annual planning evening where all members can raise issues and put forward ideas for the future of the club in a highly democratic manner. He continues to publish and manage a comprehensive annual calendar of matches and events. New club house and 25-year lease. In 2008/09 we had a new clubhouse which made a huge difference to all the members and potential members. David was instrumental in persuading the outgoing Chester City Council to provide this clubhouse. He then painstakingly negotiated the long-term lease to secure tenure for the club. Liaising with the local authority, a role he still performs for the club. This is probably the most thankless and frustrating task a club member can undertake. David has sent hundreds of emails to relevant council officials not just ensuring that the council fulfils its obligations to the club in lawn maintenance but driving officials to install a lengthy new fence. David tracks down the correct officials and councillors, organises meetings, explains the issues, and forces them into action by never giving up pestering. A prime example this year has been lawn watering. The lawns have been in grave danger from the drought without a sprinkler system. Over months officials have been stalling, giving excuses and doing nothing. David cut through all their objections, organised members to provide a working party to help the grounds-people and finally achieved daily watering of our lawns. Contribution to the North West Federation and the CA. David has ensured that the club has played a full regional role. Under his encouragement the club hosts NW and National tournaments each year. David produced a new data protection policy for the club which was then taken up by others in the North West. He co-authored the note on roles within the CA to stimulate a more thorough approach to effective governance.